Publication Day! Links! Tired Neil! I've been stumbling across the UK, although mostly in and out of the BBC. I spent a day at the Guardian offices, editing their book website. (Here's a video: http://www.guardian.co.uk/books/video/2013/jun/17/neil-gaiman-guardian-books-video). One reason I picked the Dadd was that I'd just been spending time at the Tate in company with the painting, for Intelligent Life magazine. Today THE OCEAN AT THE END OF THE LANE comes out officially. I will get up in a few hours and fly to New York for the Brooklyn signing. $10 with $5 off THE OCEAN AT THE END OF THE LANE with ticket purchase. $21 adults $19 students (with ID) and seniors plus service charges. General admission. So much is happening. The tour machine has started to grind and whirr, and I have packed as much as I can of my life into a wheelie suitcase and a backpack, climbed onto a train, and I will not be home for a month and two days, and the tour proper, which starts tomorrow, does not end now until the very end of August. I will be on planes and I will be on a tourbus and I will sleep in hotels. I will see Amanda again at the end of July for about 8 days between getting back from San Diego Comic Con and going off to sign in Canada, and then again for a few days at the end of September as she returns from Australia before we both go in different directions again. I'm going to try and use this blog more, as a journal and as a place you can find out what's going on. The Ocean at the End of the Lane comes out in a week. I am more nervous about this than I have been about any book I have ever published. So many articles, so many interviews, so many reviews. You are not expected to read them all. Even I am not expected to read them all. Put simply, The Ocean at the End of the Lane is the best-written book of Gaiman’s career. It features a level of craftsmanship, focus, and control that we normally associate more with literary fiction than genre. The book is focused, lyrical, and profoundly perceptive in its exploration of childhood and memory, and it’s also quite frightening—like one of Truman Capote’s holiday stories by way of Stephen King. Is it, like Coraline or The Graveyard Book, suitable for children? It’s not being marketed as such. Reading some of the more nightmarish scenes, and the act of domestic abuse that lodges horribly in the novel’s throat like a silver shilling might (coins are a Gaiman staple and make a reappearance here), it’s easy to see why. If it’s not just for adults, and not quite for children, there is one age-flexible group it is written for. An obtuse thing to say about a book it may be, but The Ocean at the End of the Lane was written for readers. It’s for people to whom books were and are anaesthesia, companion, and tutor. If you’re one of them, you’ll want to wade into it, past your ankles, knees and shoulders, until it laps over the crown of your head. You’ll want to dive in. There are very adult themes in Ocean, which are obvious to the reader but which go over the head of the main character. Given his reputation as a children's author, is he at all concerned that younger readers might want to give Ocean a go? "It isn't a children's book but some younger readers might think they're ready for it. That's why I started the book off with a couple of really dry chapters. It's like, if you've made it this far, then you might be ready for the rest of it." He smiles and holds a hand up high, palm downwards. "You have to be this tall to go on this ride." The tour starts in the UK with two pre-publication signings: Bath on June 14th: http://www.toppingbooks.co.uk/events/bath/neil-gaiman/ for tickets and info (it just moved to a bigger Venue, The Forum). The Royal Society of Literature event on the night of the 17th in London is Sold Out. More information on the rest of the tour (except for Canada and some of the August UK things that haven't yet been announced) over at http://www.neilgaiman.com/where/. It's not up-to-date on sold-out events though: New York, Washington DC, Atlanta, Phoenix, SF, Portland, Seattle, Chicago and Lexington are all sold out. Right. Back to work. Back to reality. Iain Banks. With or without the M.
I should be blogging about The Ocean at the End of the Lane, because it comes out in 9 days and the reviews and articles are starting, and right this minute I should be doing the writing I have to finish before I hit the road. 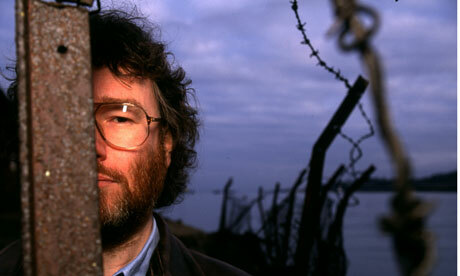 But I just learned that Iain Banks is dead, and I'm alone in this house, and I cope with things by writing about them. I met Iain in late 1983 or early 1984. It was a Macmillan/Futura Books presentation to their sales force, and to a handful of journalists. I was one of the journalists. Editor Richard Evans told me that he was proud that they had found The Wasp Factory on the slush pile -- it was an unsolicited manuscript. Iain was almost 30, and he got up and told stories about writing books, and sending them in to publishers, and how they came back, and how this one didn't come back. "You ask me what's The Wasp Factory about?" he said. "It's about 180 pages." He was brilliant and funny and smart. We were never good friends, mostly because we were never in the right places long enough. We were pleased to see each other. We ate together. We talked. We liked each other's work. We always figured we'd have more time. The last time I saw Iain was in Edinburgh, in August 2011. Amanda and I had taken a big house for the duration of the festival, and on the night that she did a gig in Glasgow, I invited over a bunch of writers and a bunch of actors and comedians who really liked writers. Because Iain was coming over and he had written Raw Spirit, a book about going around Scotland to find the perfect dram of whisky, I bought the most special and fancy bottle of whisky I could for the night, especially for him. He arrived with a large bottle of red wine. "I don't really drink whisky any more," he admitted. "Not since the book." The ridiculously fancy bottle of whisky was tasted by everyone except Iain. It was a fine and glorious night. There were fireworks, which didn't go off as expected, and the best conversation, and I was looking forward to repeating it this year. In April I heard Iain had terminal cancer. I didn't write to him. I froze. And then, a week later, with no warning, my friend Bob Morales died, and I was upset that I hadn't replied to Bob's last email, from a week or so before. So I replied to Bob's last email, although I knew he'd never read it. And then I wrote to Iain. I told him how much I'd loved knowing him, how much I'd enjoyed being his friend, even if we only saw each other in the flesh every few years. I think you're a brilliant and an honest writer, and much more importantly, because I've known lots of brilliant writers who were absolute arses, I think you're a really good bloke, and I've loved knowing you. And he wrote back and said good, comforting, sensible things. Goodbyes are few enough, and we take them where we can. I hoped that he'd get better. Or that he'd have time. He didn't. Hearing of his death hit me hard. If you've never read any of his books, read one of his books. Then read another. Even the bad ones were good, and the good ones were astonishing. torchyvalentine asked: What would you say to Sir Ian Mckellen taking the reigns as the 12th Doctor? For that matter, who do you think would be a good actor for the character? I think that if you’d asked me who should be the 11th Doctor 5 years ago I wouldn’t have listed Matt Smith, because I didn’t know who he was or what he was capable of, and if you’d asked me who should play Sherlock Holmes in a modern day revival around the same time I wouldn’t have said Benedict Cumberbatch, because I didn’t know who he was either. I actually like it when The Doctor is a relatively unknown actor, or one without one huge role that made them famous. A star, like Sir Ian, brings all the other roles they’ve ever played to the table when they act. Seeing John Hurt as the (Spoiler) at the end of the Name of the Doctor, meant that this was a certain type of part with a certain amount of gravitas, and you understood that John Hurt was bringing everything with it (including being John Hurt), just as Derek Jacobi did as the Master. But I like to see The Doctor as The Doctor, and an actor who doesn’t bring baggage is a grand sort of thing. A star waiting to happen. So I don’t want to see Helen Mirren or Sir Ian McKellen or Chiwetel Ejiofor, or any of the famous names people are suggesting. I want to see The Doctor. I want to be taken by surprise. I want to squint at a photo of the person online and go “but how can that be The Doctor?”. Then I want to be amazingly, delightedly, completely proven wrong, and, six episodes in, I want to wonder how I could have been so blind. Because this is the Doctor. Of course it is. Labels: Actoring, Doctor Who, Doctor WHO?